As our infrastructure fails the complexity and safety involved with replacing failed piping has led to the innovation of trenchless technology. With the Ditchwitch 920 Gearhart Plumbing has installed and/or replaced miles of piping below buildings, driveways, highways and fields. With the vactor municipal/industrial sewer cleaning equipment, Gearhart has dug thousands of holes as is law in many municipalities without damaging gas lines, phone lines, fiber optics or other buried lines. 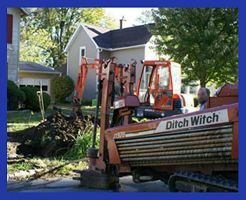 Let Gearhart Plumbing Heating and Cooling’s state-of-the-art equipment install or replace your underground line with minimal excavation.